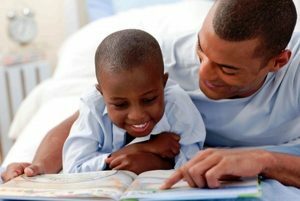 Black History Month is upon us again, and as always, many wonderful picture books are making their debut. 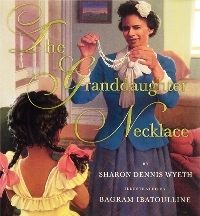 The Granddaughter Necklace, by Sharon Dennis Wyeth, is one of those books. The Granddaughter Necklace opens to a stunning illustration; a dark stretch of water set against a burnt orange sunset that seems to go on forever, and the silhouette of a lone female gazing out over the ocean from a ship’s protective guard rails. This is the reader’s introduction to a young Irish girl named Frances who, with hope in her heart and a glittering necklace in her hand, is on her way to make a new life in America. 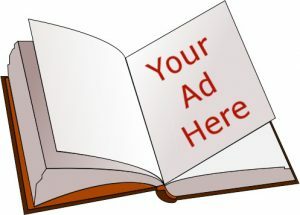 From there, the reader is whisked to the present and a fair-skinned, wide-eyed African American girl chatting with her mother about the sparkling necklace she is wearing. The mother then shares the tale–in reverse order–of how the beautiful necklace made its way from Ireland to America, and down through the generations until it reached this mother and this child. The reader learns how the girl’s mother received the necklace as a gift on the night of her school play, when she was very young. 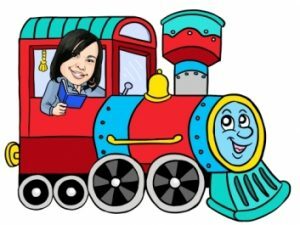 In turn, her grandmother (her mother’s mother), who lived in a shack with more than a dozen brothers and sisters, received it on the day she went to live with an aunt. And the grandmother’s mother received it after she burned her little hand helping to wash laundry in a bubbling cauldron. Back and back this story goes, until it reconnects with the girl named Frances who left Ireland in the mid-1800’s and married a free man of color in the United States. This is a quiet and thoughtful book that is all about belonging, family, and the enduring strength of women. Ms. Wyeth’s prose is cozy and encouraging, and artist Bagram Ibatoulline’s realistic illustrations are bursting with warm colors and the sweet strength of generations of strong women who have proudly served as examples for their blossoming daughters. Aside from being the perfect gift for the African American history lover, this book is also a great gift for a new mother, and even an elderly mother. It is great as a story-starter about what life was like for women in the “olden” days, and it might also be used to inspire a discussion about the traditional roles women play, and the importance of mothers in the family. Parents might also use it as a starting point for establishing their own family traditions. Whatever it is used for, family members of all ages are sure to enjoy it.